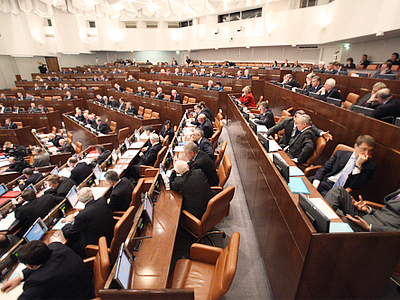 A group of deputies of the legislative assembly of Russia’s second-largest city of St. Petersburg walked out of the conference hall when the leader of the competing Fair Russia party, was making a report on his work in parliament. ­The scandal broke out early on Wednesday. The head of the United Russia faction and the chairman of St. Petersburg legislature, Vadim Tyulpanov, initiated the protest after the chairman of the upper house of parliament Sergei Mironov said that the city governor, Valentina Matviyenko, must bear personal responsibility for the death of a six-year old boy, who was killed by a heavy piece of ice falling from a roof. He also added that United Russia was fighting weather anomalies throughout the country. 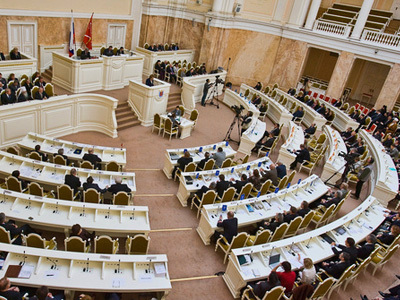 All United Russia deputies left the conference hall and several deputies from the Liberal-Democratic party followed suit. 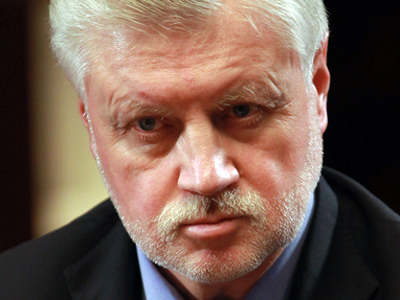 Mironov continued to deliver his report, but the hall was half empty, St. Petersburg news agencies report. Tyulpanov said that icicles fall from roofs and snowdrifts block roads in many Russian cities, not only in St. Petersburg. “If Fair Russia would label all city heads as full of vice, we will have no one left to work,” the politician said. He also called Mironov’s statements “aggressive political discrimination”. Top United Russia officials approved of their comrade’s actions. First deputy secretary of the presidium of the General Council of the party, Andrei Isayev, has said that the actions of his colleagues were “fully justified” and accused United Russia of “making PR out of blood”. The politician pointed out that the demarche was supported by another party, the LDPR, and this made United Russia’s position an objective one. The head of the United Russia party and the chairman of the lower house of the Russian parliament, Boris Gryzlov, said on Wednesday afternoon that Mironov’s problems were caused by incorrect statements of his fellow party members. 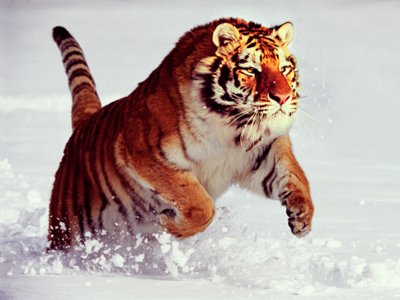 He said it was very important that United Russia managed to draw attention to the problems. He added that the most important part of the story was that the deputies did not stop their legislative work. The Just Russia party was formed in 2006-2008 as a merger of several different populist parties and movements. The party’s program is obscure, described in different times as conservative, leftist of labor. The party’s leader Sergei Mirionov has claimed that the foundation of Fair Russia was a mark for the beginning of the two-party system in the Russian Federation. While criticising the actions of the parliamentary majority United Russia, Fair Russia has never questioned the course of Vladimir Putin, which is the main point in the United Russia program.